MAURA HEALEY isn't the first Massachusetts attorney general to run roughshod over the First Amendment in pursuit of a political agenda. Martha Coakley, Healey's predecessor and mentor, adamantly defended the indefensible Massachusetts "buffer zone" law, which banned peaceful speech and silent protest on public sidewalks near abortion clinics. That law, manifestly unconstitutional, was struck down by a unanimous Supreme Court in 2014. Now Healey is embarked on her own crusade to punish freedom of speech. The vendetta this time isn't against opponents of abortion, but against ExxonMobil — and, by extension, against any organization that questions the anti-fossil-fuel agenda of global warming alarmists. 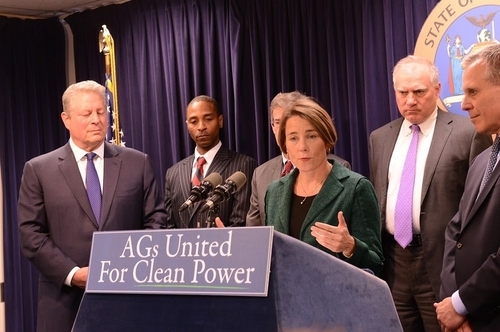 At a press conference last spring, Massachusetts Attorney General Maura Healey joined former Vice President Al Gore and several other state attorneys general is declaring war on ExxonMobil for having "deceived" its investors about climate change. That isn't how Healey would put it, of course. Her formal explanation for the astonishingly sweeping subpoena she has issued to Exxon — a demand for 40 years' worth of company documents, letters, emails, phone messages, notes, and recordings — is that her office is pursuing allegations of fraud and consumer-protection violations. As Healey's chief legal counsel has written, Exxon is suspected of trying to "mislead the public, including investors and consumers, with respect to the impacts of climate change." Mislead them how? By claiming that it was appropriate "for Exxon to utilize its substantial fossil fuel reserves for the manufacture and sale of petroleum products," despite knowing that fossil-fuel use and climate change are related. In essence, Exxon is being charged with fraud because it remains in the business of producing and selling energy. To be sure, Healey's office hasn't actually sued Exxon for any fraudulent practices. Its litigation so far is aimed at forcing the company to disgorge an ocean of records and correspondence that Healey's staff can then trawl for evidence of wrongdoing. But the attorney general hasn't bothered to wait for evidence. At a press conference last March, where she joined former Vice President Al Gore and several other state attorneys general, Healey pronounced Exxon guilty of the fraud yet to be investigated. Taking the podium, behind a sign reading "AGs United For Clean Power," Healey made it clear that her mind was already made up. "Fossil fuel companies that deceived investors and consumers about the dangers of climate change should be — must be — held accountable," Healey said. "We can all see today the troubling disconnect between what Exxon knew, what industry folks knew, and what the company and industry chose to share with investors and with the American public." Her office would be "investigating" Exxon, in other words, because she had already decided that Exxon was wrong. Give the attorney general credit for candor. At the press conference that day, she could not have been more explicit: She intended to use her official powers to promote her political agenda. "There is nothing we need to worry about more than climate change," she insisted. "Nothing is more important . . . we have a moral obligation to act. That is why we are here today." She promised "aggressive action . . . to address climate change and to work for a better future." As a citizen and a politician, Healey is fully entitled to condemn fossil fuels, decry global warming, and express scorn for those who don't agree with her and Gore. As the chief law-enforcement officer of Massachusetts, she is not entitled to deploy subpoenas and other investigative and legal tools in order to harass or demonize businesses and organizations that express opinions she doesn't share. Not even when the opinion is on a topic that she considers "more important" than anything else. The scientific and policy debate over climate change is vigorous and ongoing. It is no more settled than the debate over abortion. And just as the First Amendment flatly forbids Massachusetts officials from using their powers to silence free speech about abortion, it forbids them from using those powers to squelch competing arguments and views about fossil fuels and global warming. Fortunately for the Bill of Rights, Exxon has deep pockets and the legal muscle to resist Healey's attempted coercion. The company has gone to federal court to stop the AG's subpoena from being enforced, arguing that it amounts to an unconstitutional abuse of prosecutorial power for political reasons. Healey has been ordered by US District Judge Ed Kinkeade to appear in a Dallas courthouse next week for a deposition. To date, no one has offered any evidence that that Exxon has falsified data, suppressed lab results, or lied through its teeth when asked about the impact of its products on earth's climate systems. There has been nothing comparable, for example, to the 2009 "Climategate" scandal at the University of East Anglia's renowned Climatic Research Unit, which involved the deliberate deleting of inconvenient emails and blackballing of scientific papers. On the contrary: Exxon has been participating openly and actively in the climate-change discourse for decades. It has worked with the Intergovernmental Panel on Climate Change from its inception, funded research into climate science at Stanford and MIT, and published scores of climate-related research papers in peer-reviewed journals going back to the early 1980s. And for at least a decade, Exxon's reports to shareholders have noted openly that climate change could pose a risk to the company's future earnings. The charge of fraud is a potent one, far too consequential to be hurled recklessly by any government official, never mind an attorney general. To Healey, Exxon's position on climate change may be intolerable. What she proposes to do about it is unconstitutional.